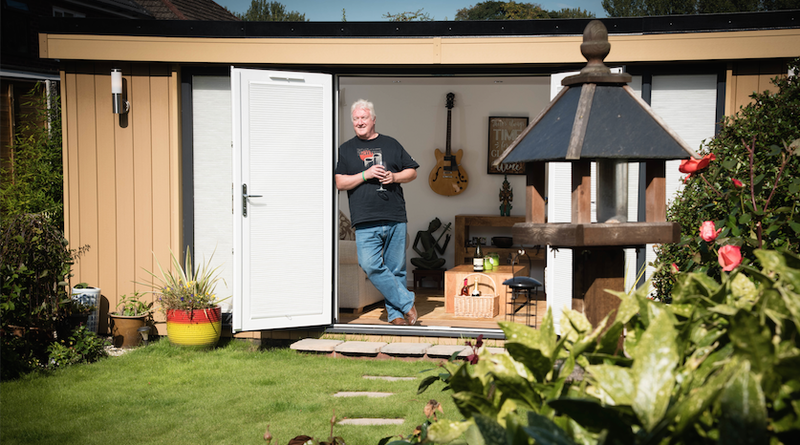 Ged Totton has built a new Garden Room in Warrington, Cheshire for use as a Music Room. 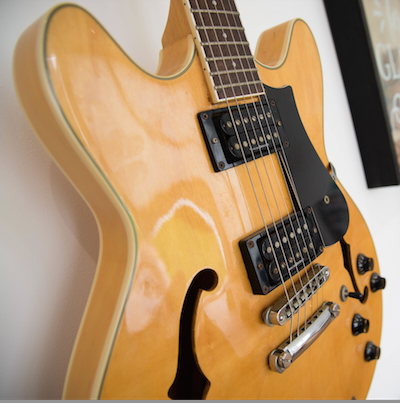 He now has space to display his treasured collection of guitars and vinyl music, thanks to Rubicon Garden Rooms. It’s also a room to relax with the family and make the most of the garden, whatever the weather or time of year. Ged and his wife Susan wanted a zero-maintenance garden building that would give them a place to chill out, with heating power and full IT connections, and also where Ged can play his beloved guitars or listen to the recordings that he has amassed over the past 40 years. He has been adding to his guitar collection for some years and has four mounted on the walls of the garden room, with another on display on a stand. Among his prized possessions is a classic Gibson Les Paul electric guitar, which Ged acquired in Singapore where he and Susan lived for 15 years until they returned back to the UK, to be nearer their grandchildren. Originally from near Newcastle-upon-Tyne, Ged worked in IT and management consultancy until retirement brought him and Susan, 58, back to Woolston in Warrington, with a new home and a small photography business. Describing how they came to choose a Rubicon Garden Room, Ged said: “We had been considering getting a conservatory at the back of the house but we realised this wouldn’t get the sun on it until early evening in the summer, which wasn’t what we wanted. “We decided a garden room was the answer, so we went to look at a few, which would allow us to have a view across the garden and back towards the house. “We looked at two or three different suppliers then we found Rubicon Garden Rooms. We realised that the company’s showroom wasn’t very far away from us, in North Wales, so took the opportunity to visit and meet Managing Director John Lyon and his team. “Right from the start we were impressed by the quality of workmanship and materials used in their garden rooms, so it was a simple decision for us to order one. “Our new room measures three by seven metres, is maintenance free and includes fittings such as heating and multiple power-points. I also got John to fit a special ‘clean’ circuit, which is free of interference to plug an additional wi-fi router into, so we have all the mod cons! Ged added: “We’ve since decorated the room ourselves to put our own stamp on it and we’re both really enjoying using it. We also see the value that we’re going to get out of it in the coming years. “Many years ago I used to play in bands back in the north east but I was mainly a drummer and always wanted to play the guitar. “Susan paid for me to have lessons a few years ago and now I enjoy playing the guitars from my collection, which includes both electric and acoustic ones, as often as I can….although very badly! “Now we have the garden room, a mate of mine regularly joins me in the odd jam session. I can now see us sitting in there strumming away, whatever the weather, because of the heating and insulation that was installed. “I can also listen to the music I started to collect more than 40 years ago. Most of it is now, as is common these days, listened to digitally, but the vinyl has some special memories attached to it. “Susan and I have a son, a daughter and four grandchildren, so we will also be using it as a place where we can enjoy a nice glass of wine and look out over our small garden, which we love pottering about in.